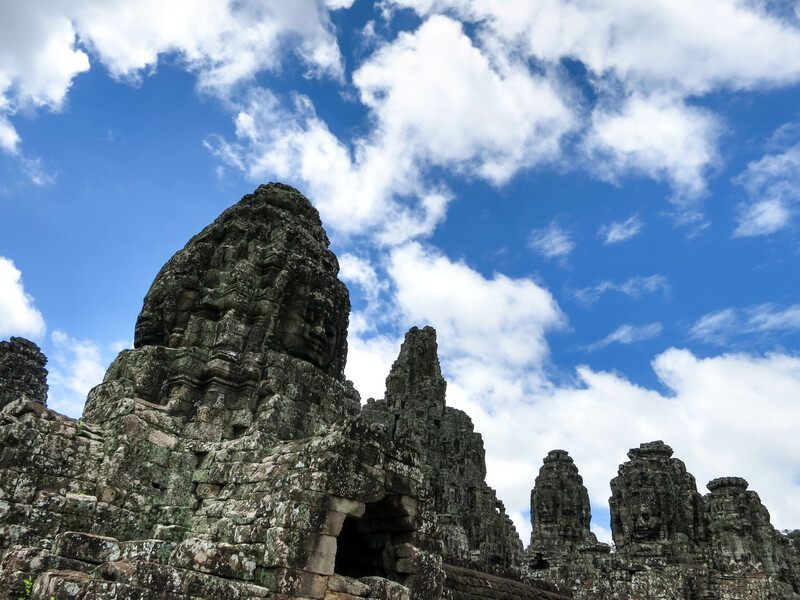 After a three-day break on the Cambodian coast, I caught a 10 hour overnight sleeper bus to Siem Reap – the modern day city at the center of the old civilization of the Khmer empire. 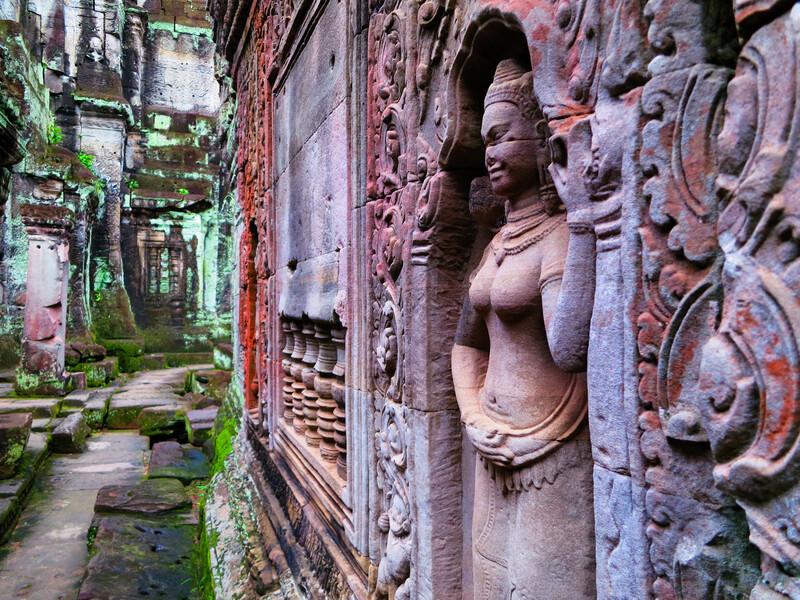 And potentially the most regarded destination in Southeast Asia was located here – Angkor Wat. 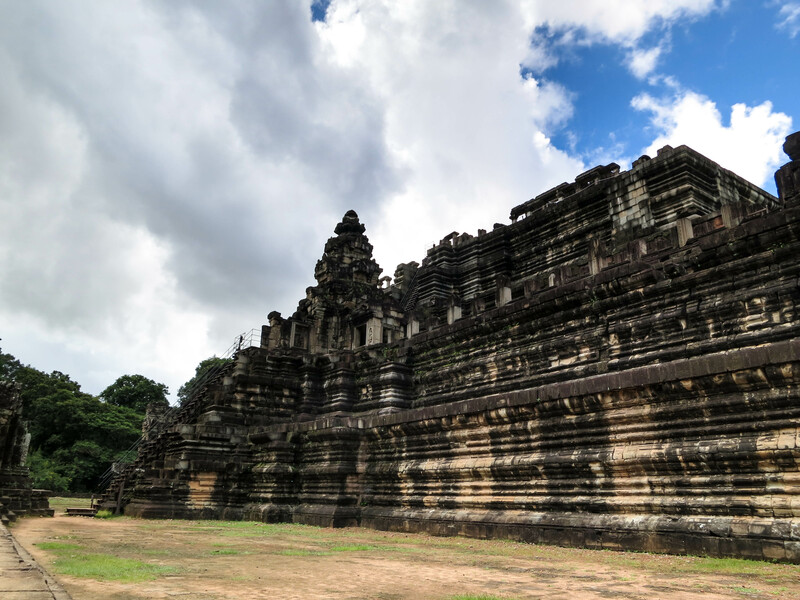 Angkor Wat was the most prominent temple in the old civilization among many temples and complexes which were built during a span of four centuries and were actively used for centuries beyond the fall of the Khmer empire. Before arriving in Siem Reap, I received a tip from a Spaniard working at the beach hostel in Cambodia. 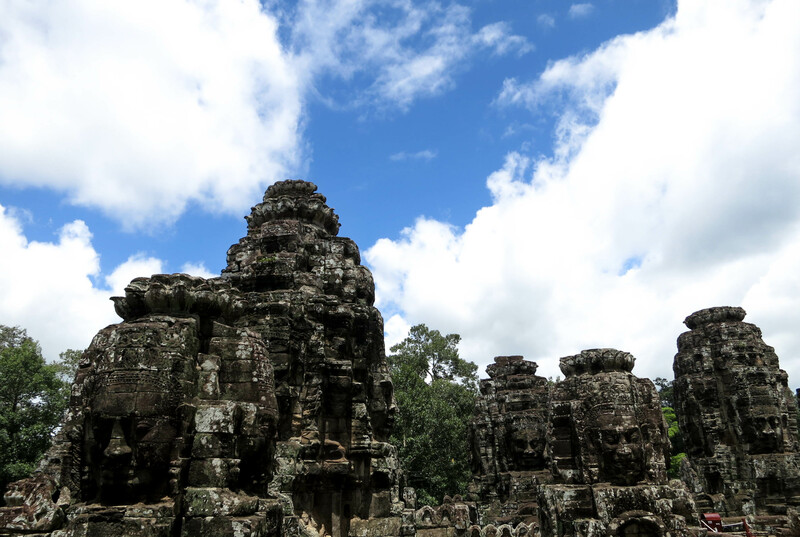 He mentioned the civilization surrounding Siem Reap was huge (~100km) and that he spent close to 10 days visiting all the ruins. I decided to try to do the same. 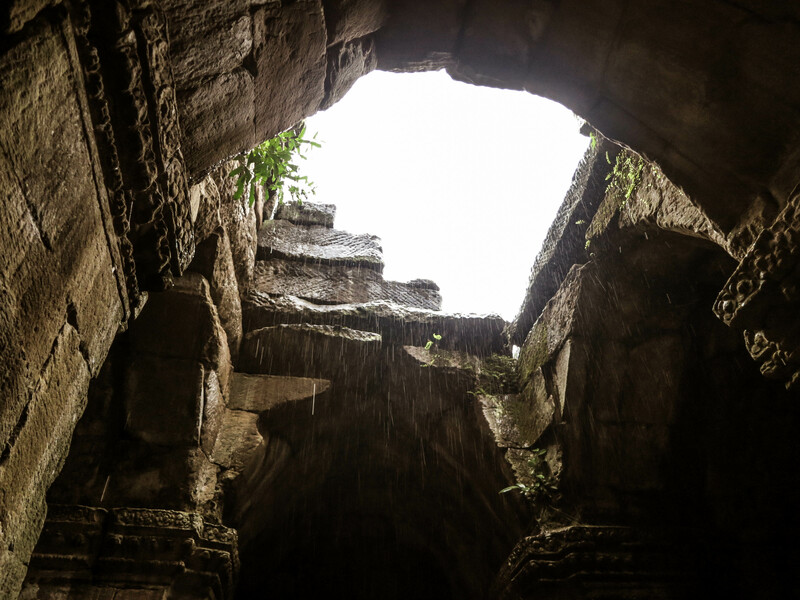 I coordinated my visit to Siem Reap with Ankur and Jan. Ankur was finally arriving into his most anticipated destination of his trip and it was a pleasure to tour the ruins with him. 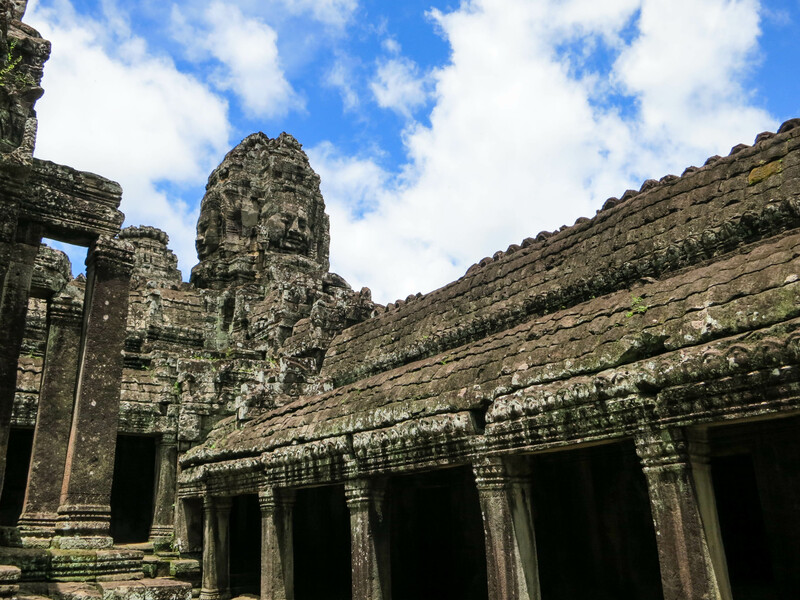 He was actually talking about Angkor Wat so much before our arrival while traveling for over a month, that the bar was set really high and I was afraid of potentially being disappointed. I was proved wrong. How I met Jan is a pretty amazing story in itself, which I will need to dedicate to a separate post. 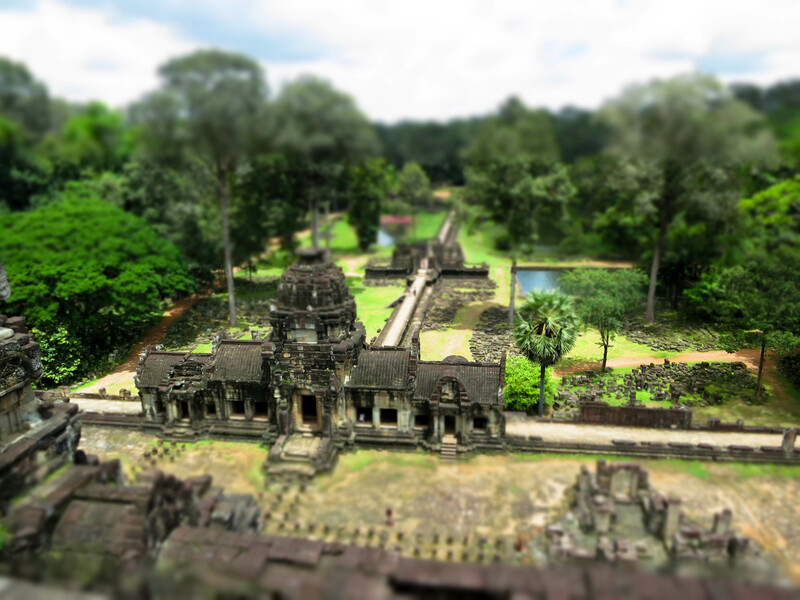 Also, given the enormity of the Angkor ruins, I will highlight the surrounding ruins here, and save Angkor Wat for a following post. 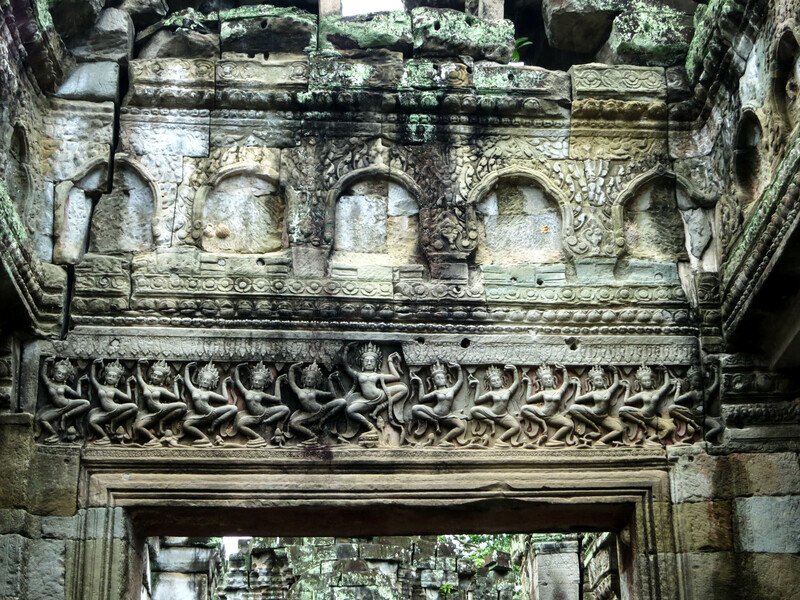 Our first morning we spent touring the giant complex of Angkor Thom and the various buildings within it. 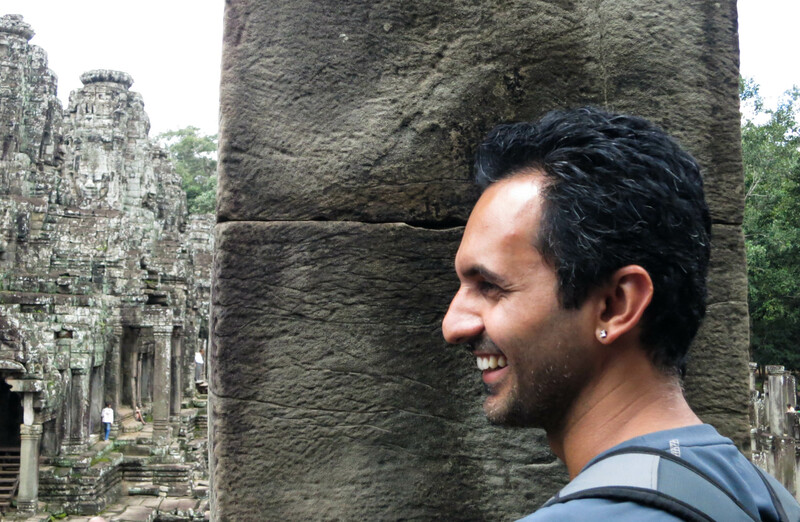 Ankur in Angkor = state of bliss. 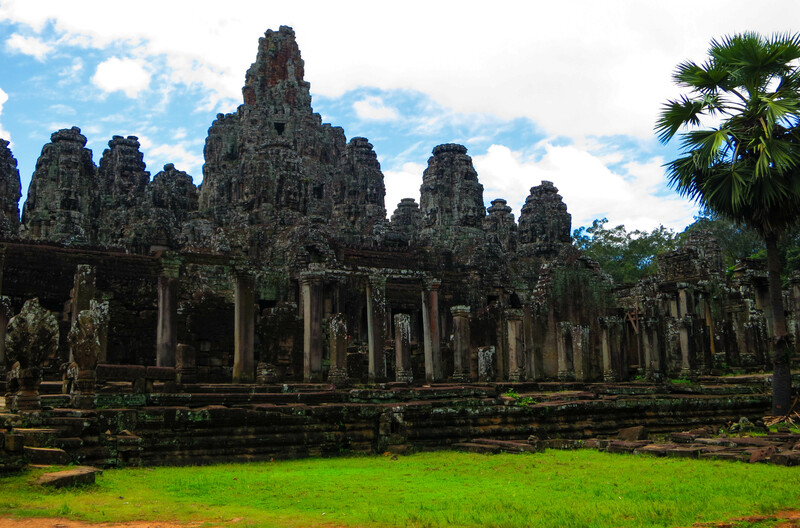 At the center of Angkor Thom was Bayon which was built in the late 12th and early 13th century. 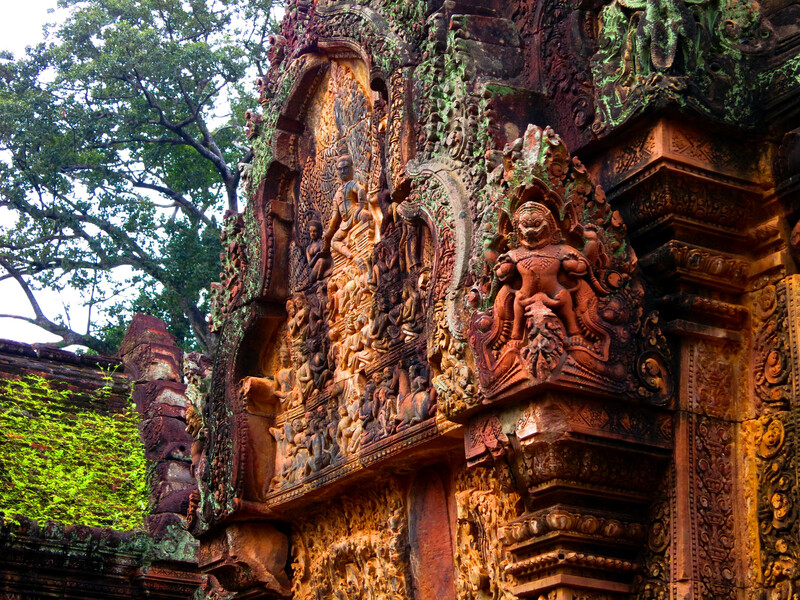 The most impressive aspect of it was the multitude of stone faces built into the structure’s facade. If you look closely, you can’t miss them. 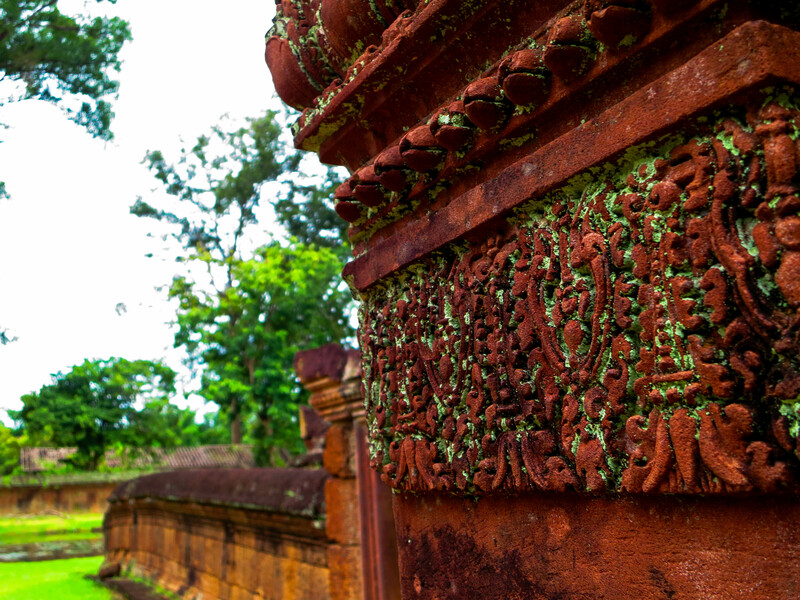 Historians believe all the faces are modeled after the king who had the temple built, King Jayavarman VII and in a state of serenity – an attempt to embody Buddha’s nirvana. 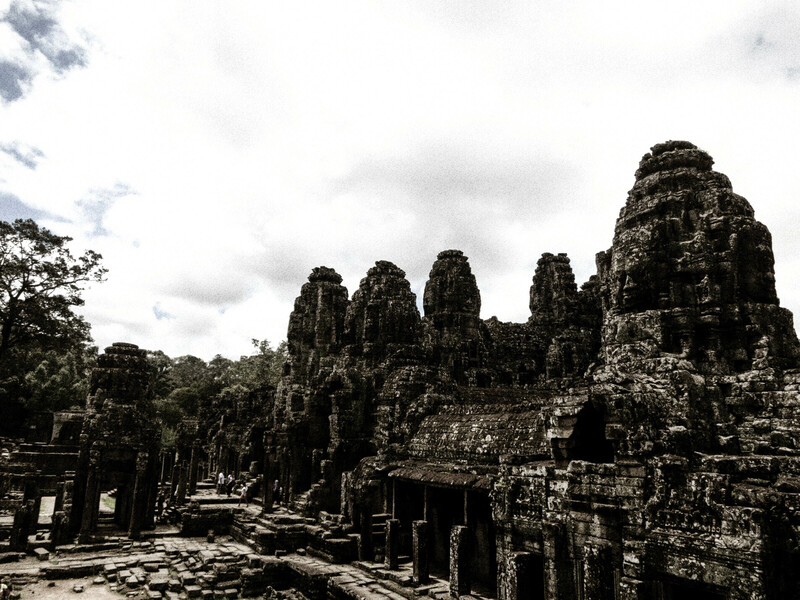 Right next door to Bayon was Baphoun which was also built around the same period. 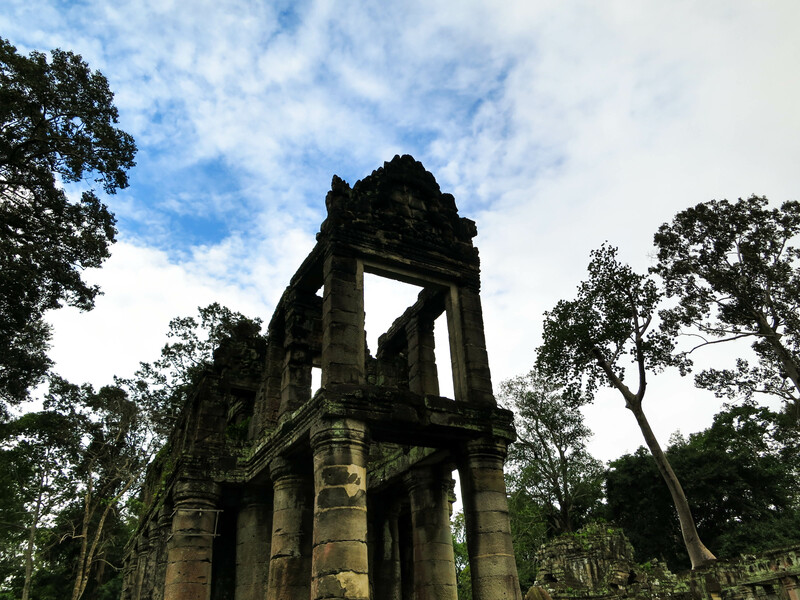 Baphoun stood at 34 meters and had since gone through many phases of collapsing and restoration. 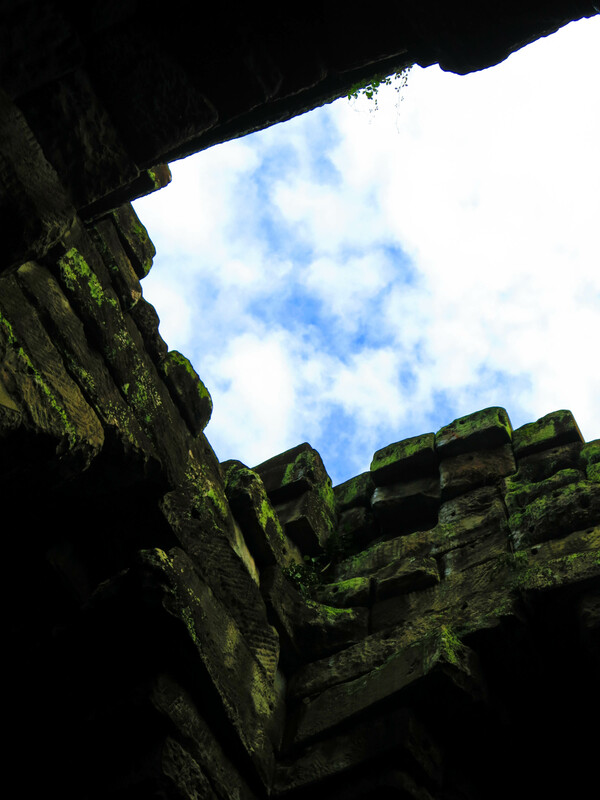 The weathered walls of the ruins during a bright day with blue skies and silver clouds was a photographic treat. 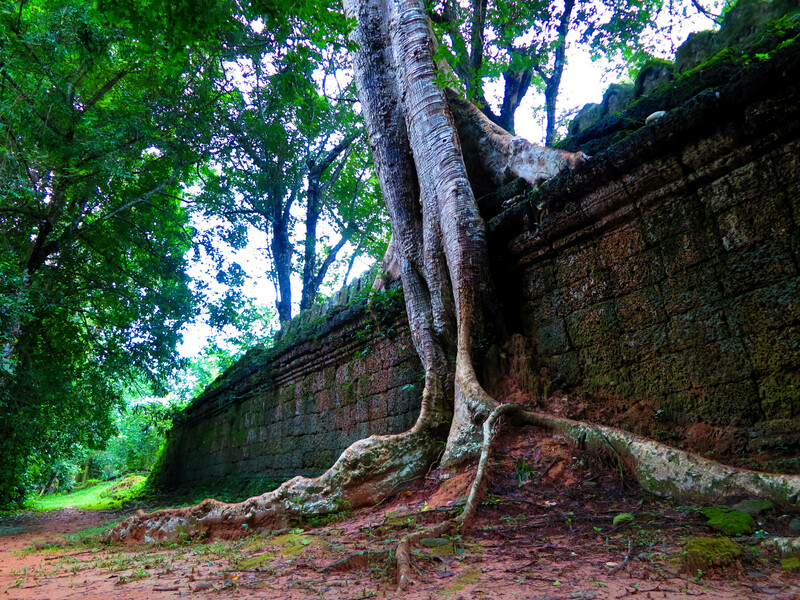 We climbed higher within the complex and caught a vantage point of the entrance to Baphuon. 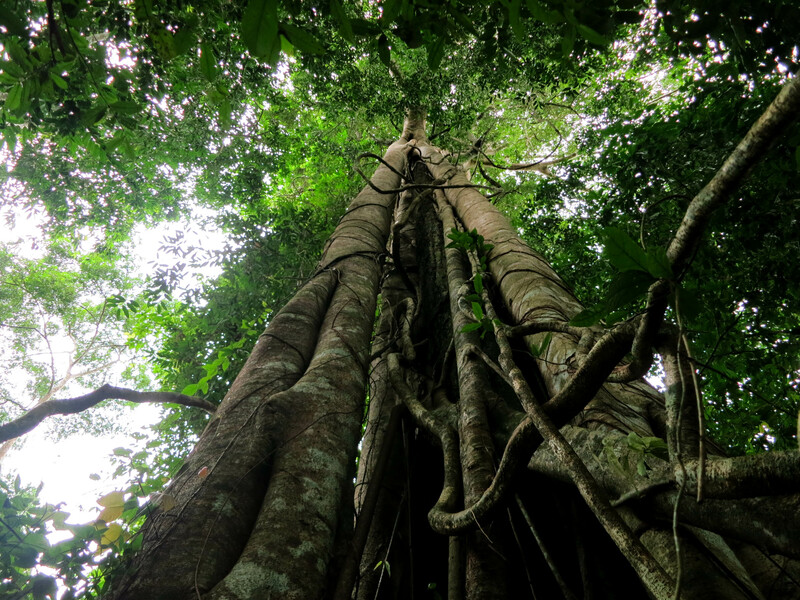 The trees of the region towered over us like brilliantly still monsters. 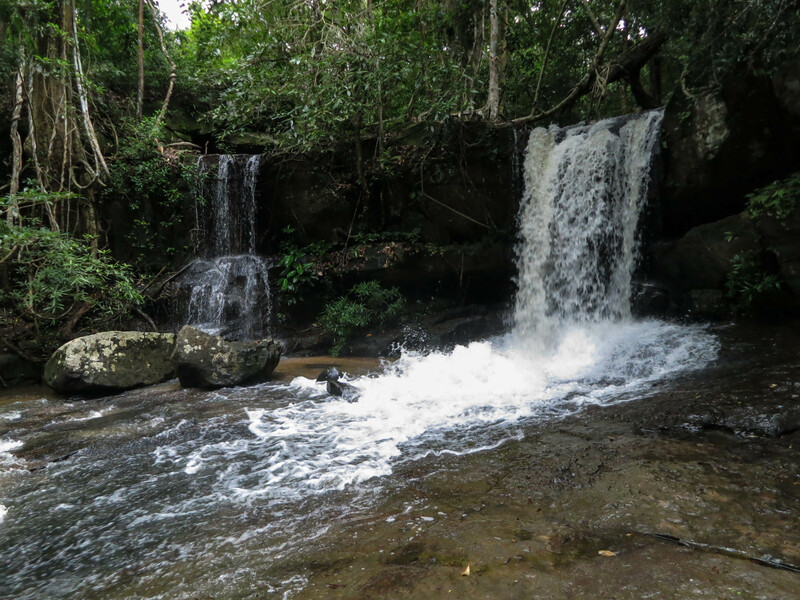 A few days later, Ankur, Jan, and myself visited the Kbal Spean river which was about 30km northeast of the center of Angkor. 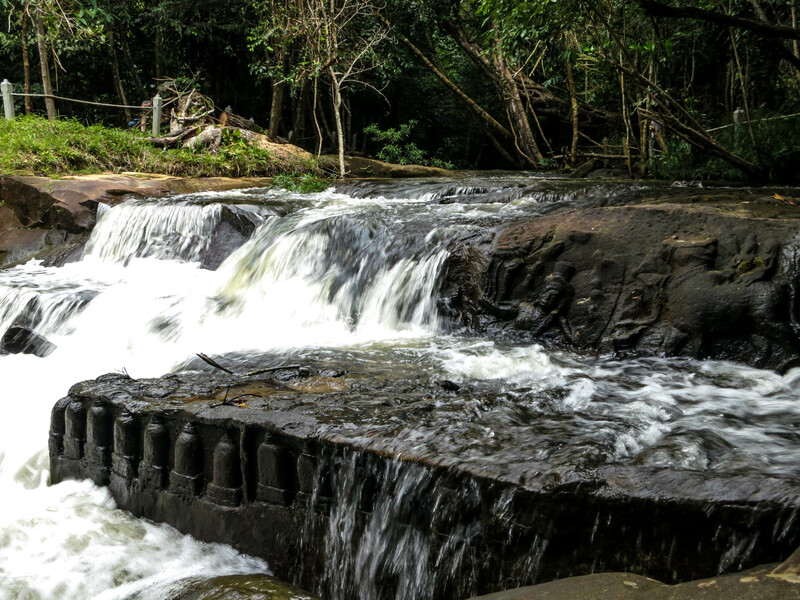 I had learned Kbal Spean was called “The River of a Thousand Lingas.” I knew a linga was the symbol of the Hindu god, Shiva, and what that meant in the context of the river I was about to find out. 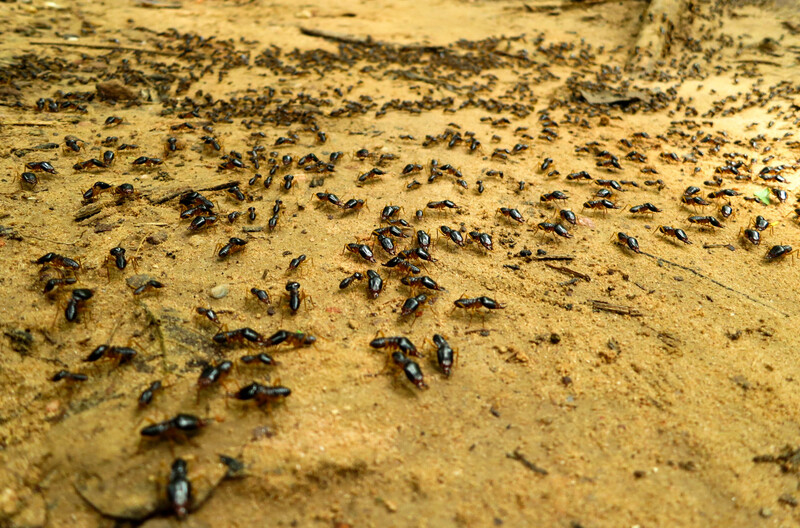 We reached the trail-head in the morning and made our way up the mountain where we encountered a lively crossing of some of the largest ants I’ve seen. 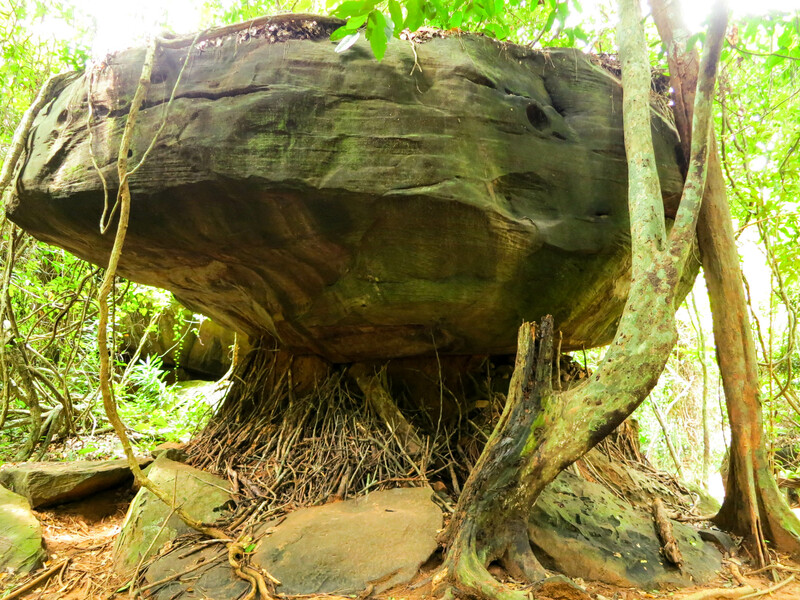 The area was full of peculiar rock and root formations. 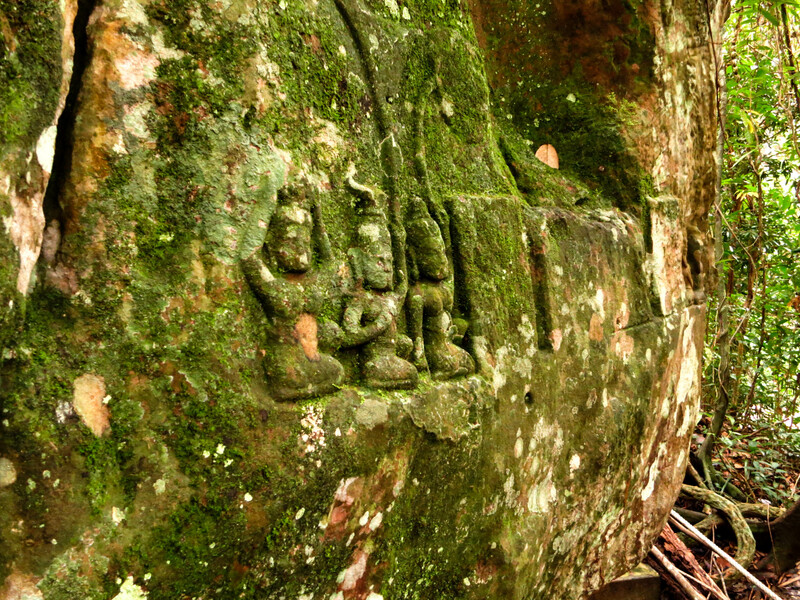 After a kilometer of walking uphill, we were surprised with the sounds of a gorge and the rock carvings built into the river. 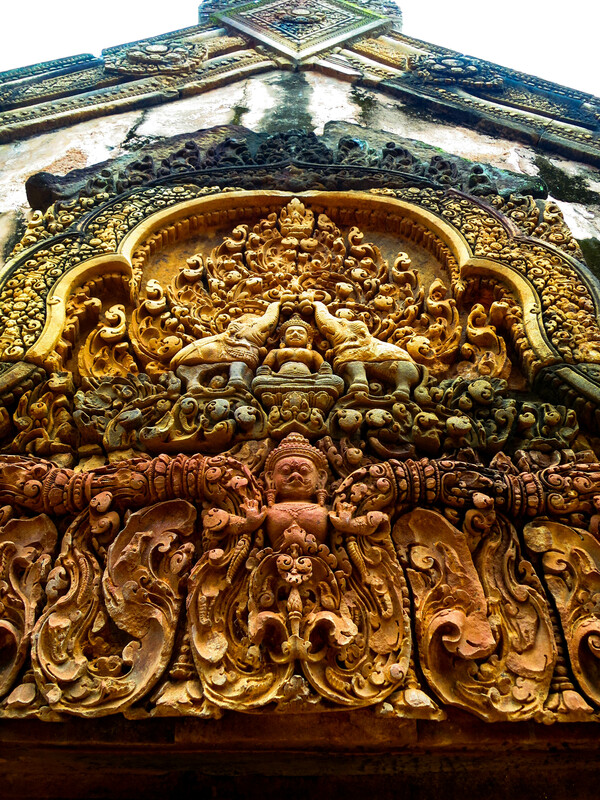 Looking closely, Hindu gods like Shiva (above) could be seen. 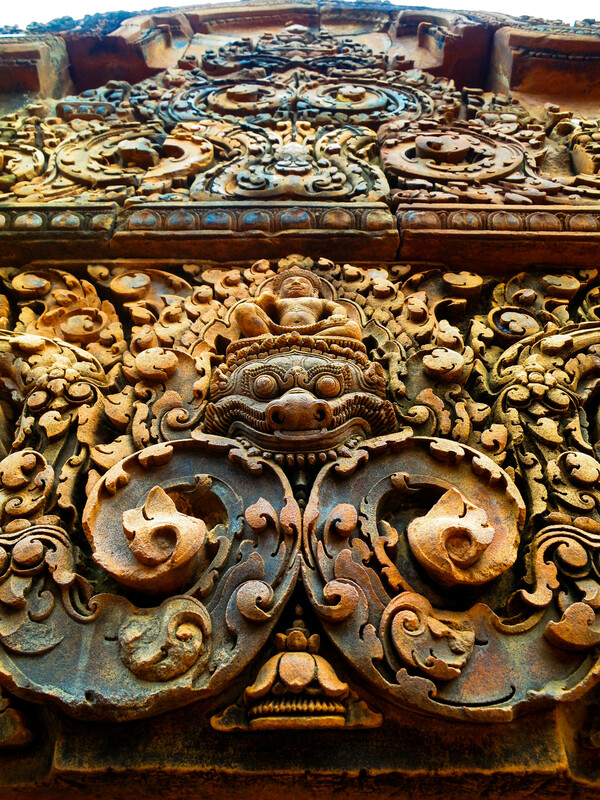 I was amazed while trying to imagine how these carvings were made centuries ago. 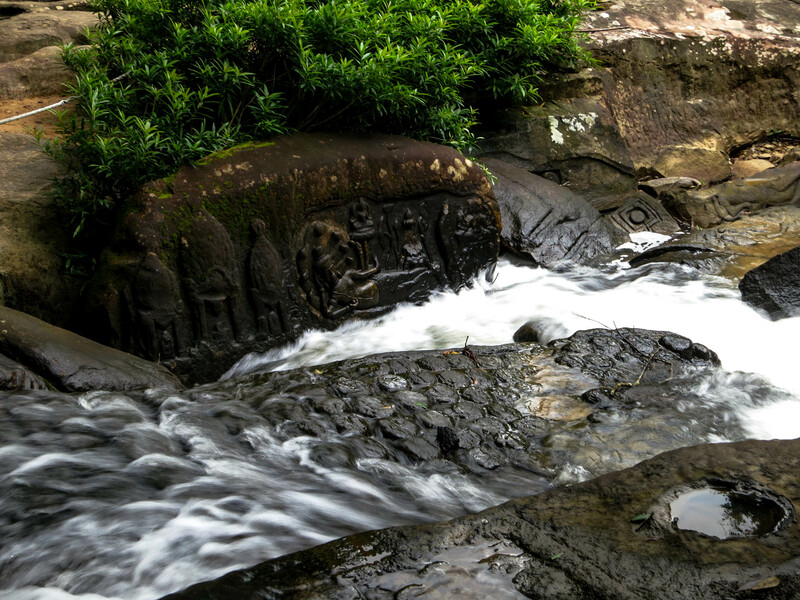 Water gushed over the small lingas with a carving of Lord Vishnu reclining, Goddess Lakshmi, and Lord Brahma floating within a lotus flower. 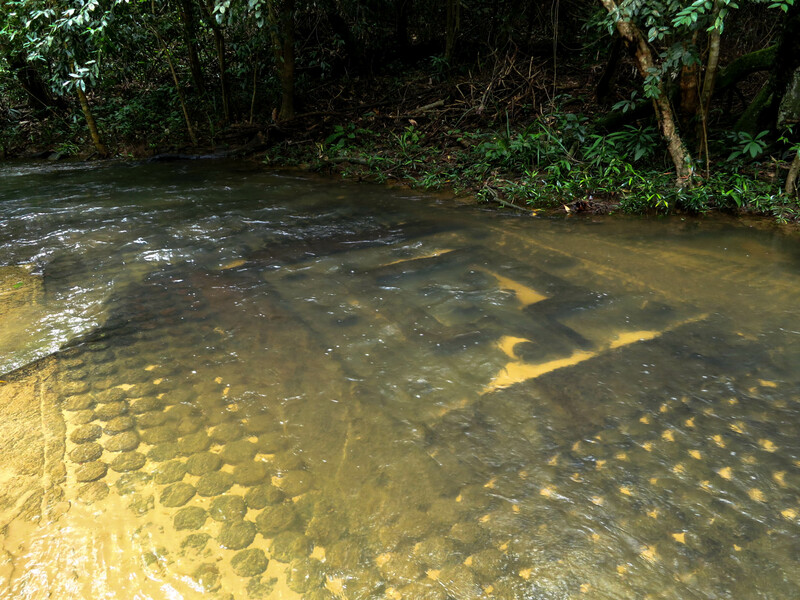 Further down, the number of lingas grew and continued downstream. “A thousand” seemed to be an understatement. 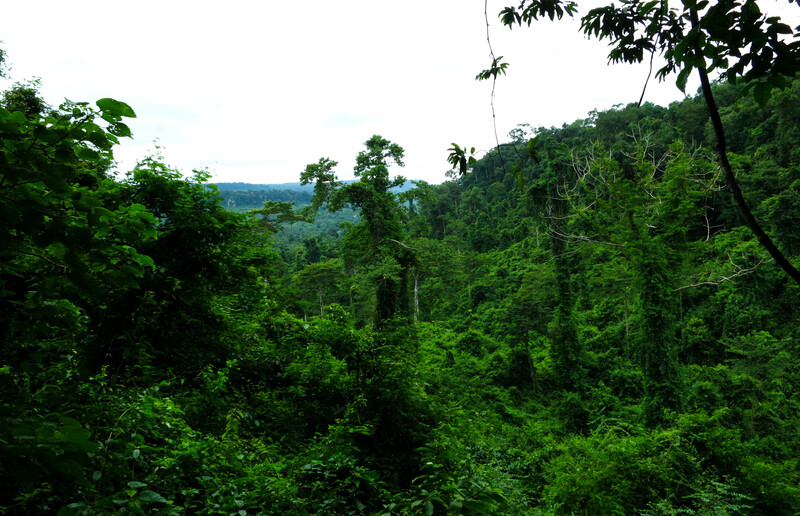 The feeling of a surrounding holiness and serenity within the jungle grew. As we were walking back down, we followed another trail which hugged the river. The waterfall was a great spot for us to relax and meditate for some time. 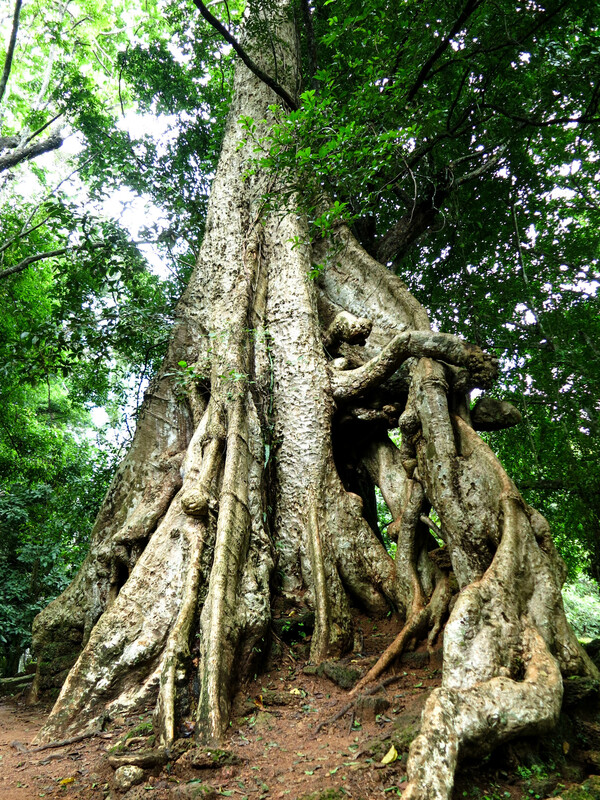 The act of looking up at roots was a rare occasion. 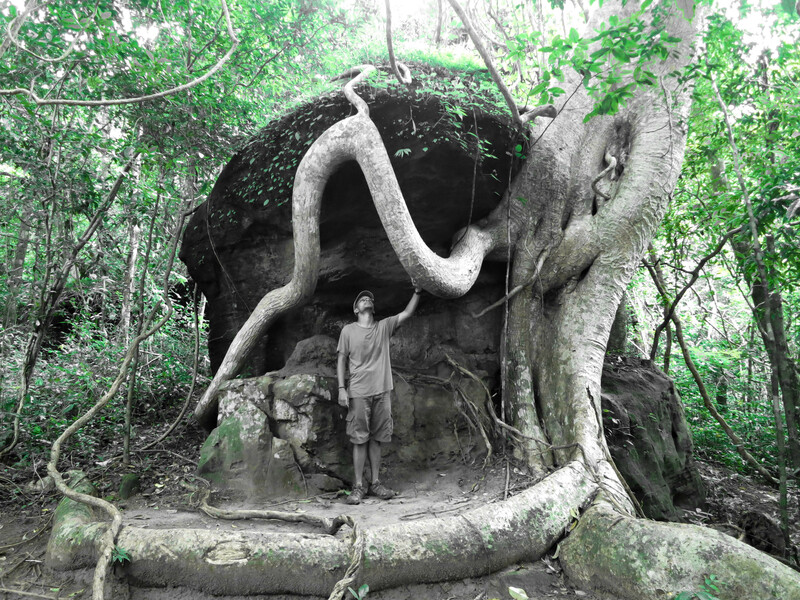 After taking a number of photos near the massive roots, a small butterfly landed on my right hand. I slowly switched the camera to my left hand and started snapping photos of it. 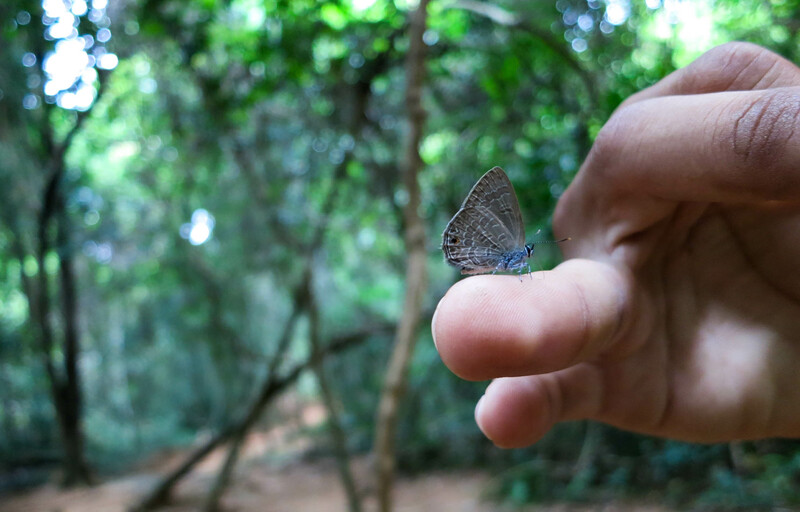 After a minute of taking pictures, Ankur and Jan had continued on the trail and the little guy was still clinging to me. I wondered if continued to walk, would I take it out of its local environment? I waited with no avail and decided to continue walking. It stayed on my hand for 5 more minutes before it decided that walking was boring and flew away. 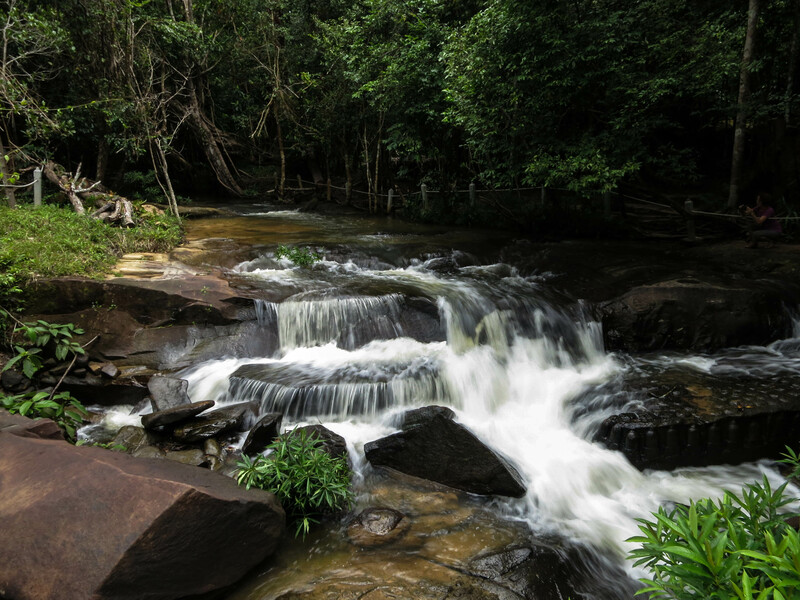 The rich jungle thriving over the Kbal Spean river. 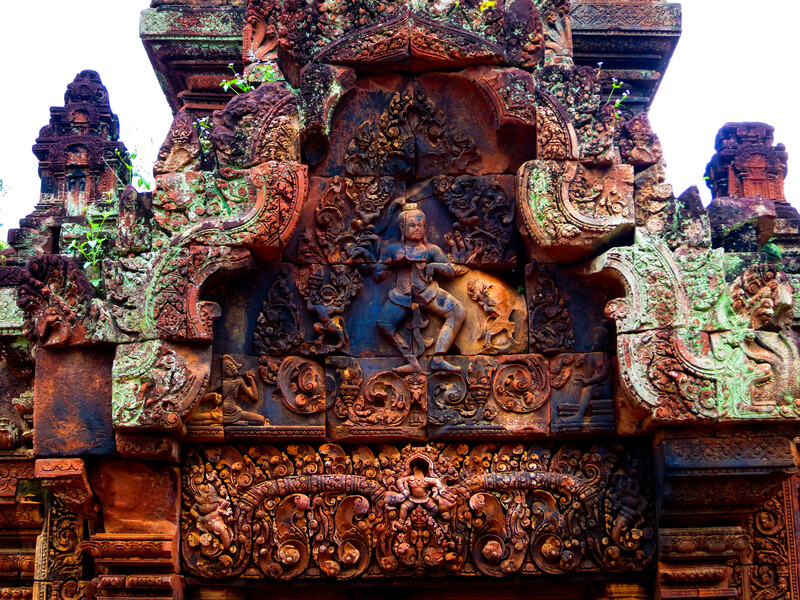 Our next stop that same day was Banteay Srei, which means Citadel of Women. 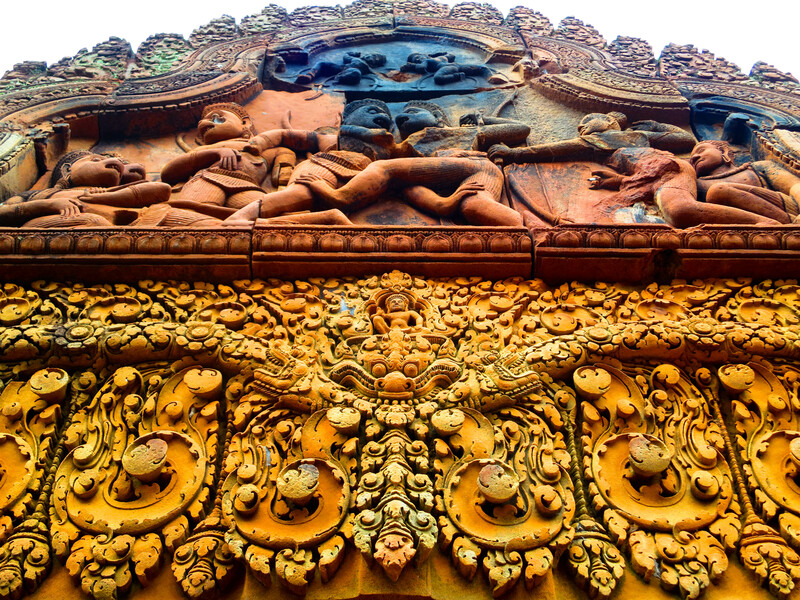 The buildings here were particularly unique since they were made of red sandstone which allowed for extremely detailed bas reliefs (frescos). 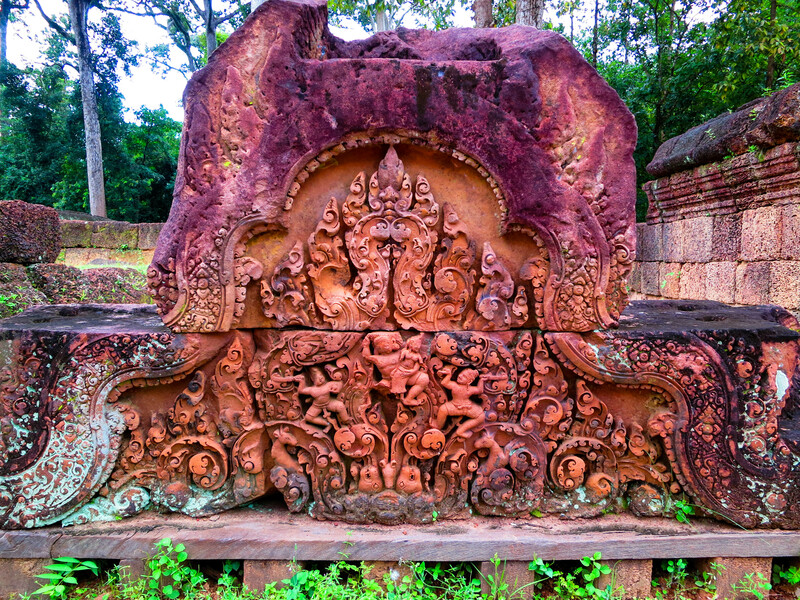 Even more amazing was that Banteay Srei was among the oldest structures built by the Khmer Empire dating back to the year 967 AD. 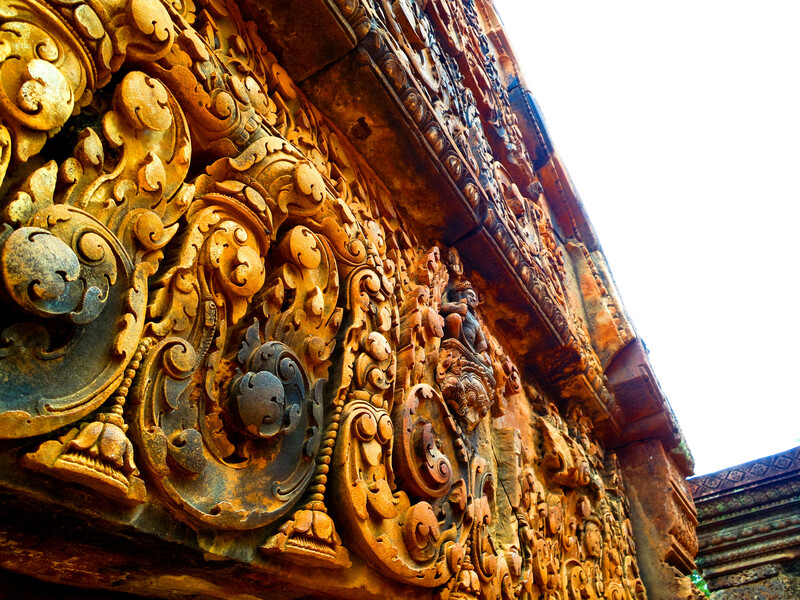 How did such details persist for over a millenium? Lord Shiva in his natural state, dancing on death. 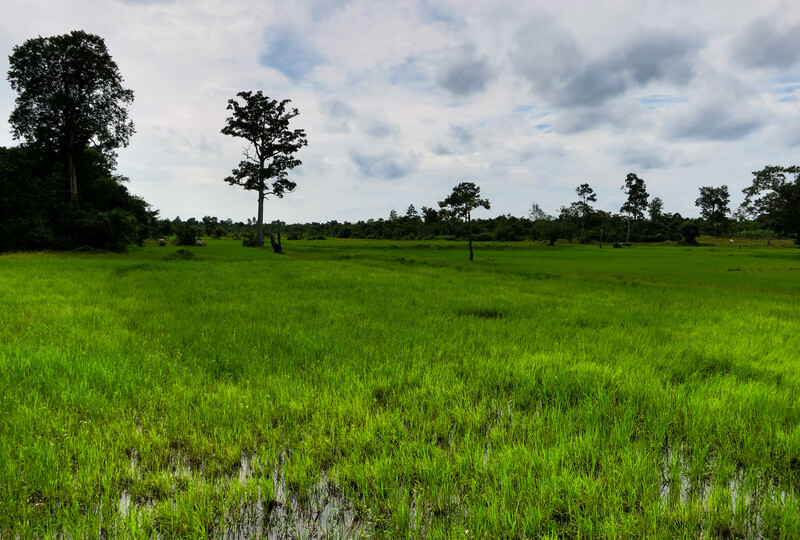 The nearby brightly lit rice paddy under the clouds was a good chance to set up my mini tripod and take an HDR photo. 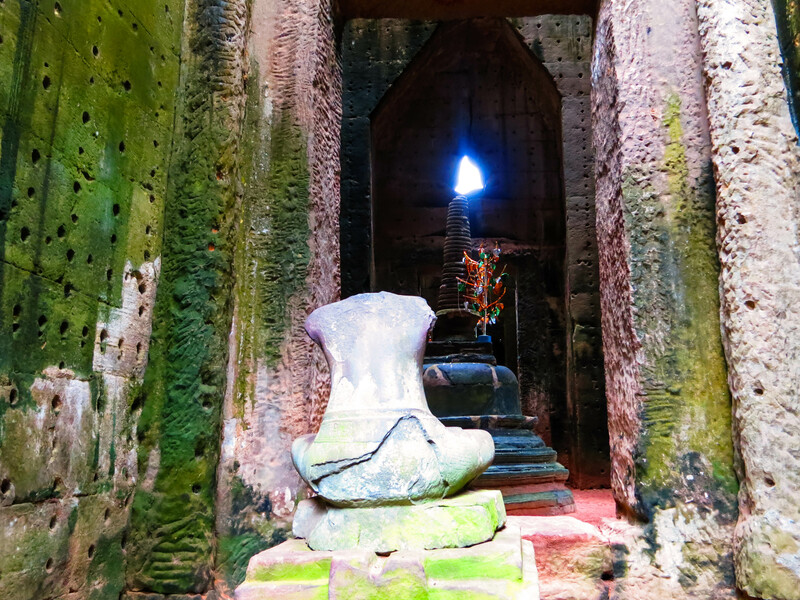 One of the days I had to myself, I decided to visit the smaller temple of Neak Poan. The temple itself is actually built on an artificial island. 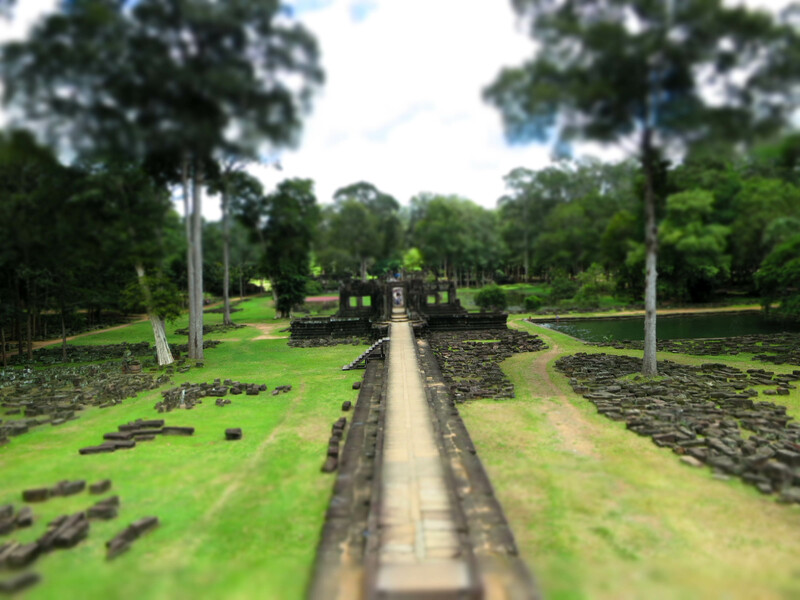 The temple and pond at the center of the complex. 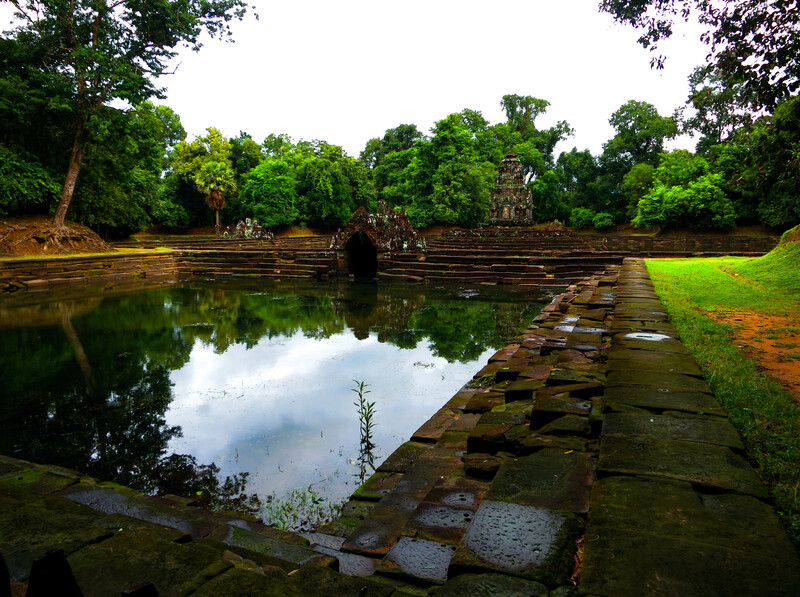 The northwestern pool of Neak Poan. 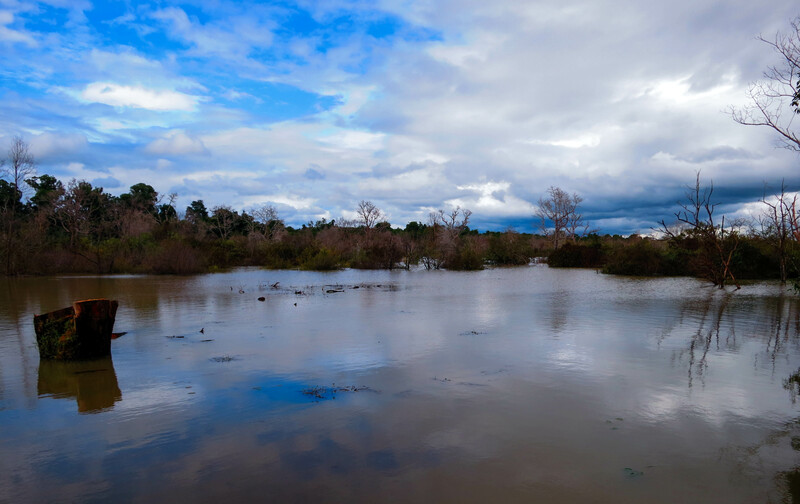 The four surrounding pools were believed to represent Earth, Fire, Wind and Water. 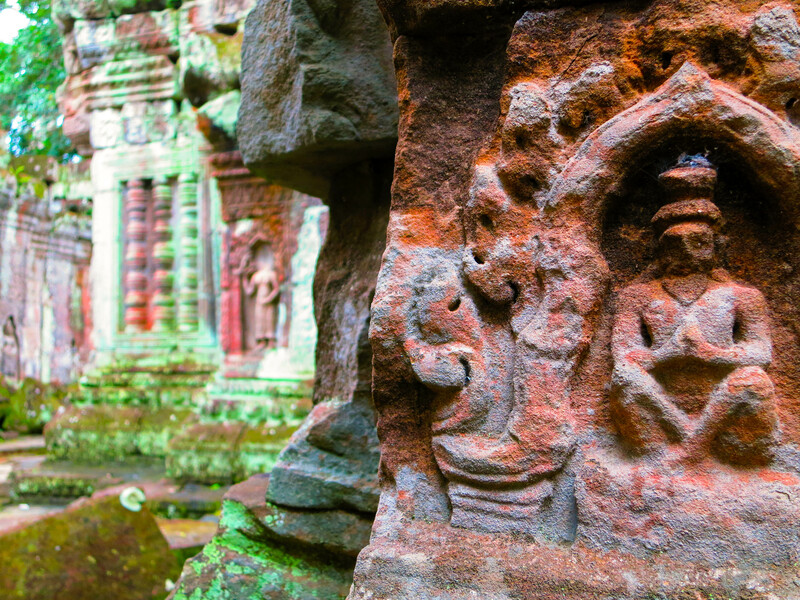 Those four elements were thought to balance the elements within anyone who bathed in the ponds which is why Neak Poan was the site of medical healing in Angkor. 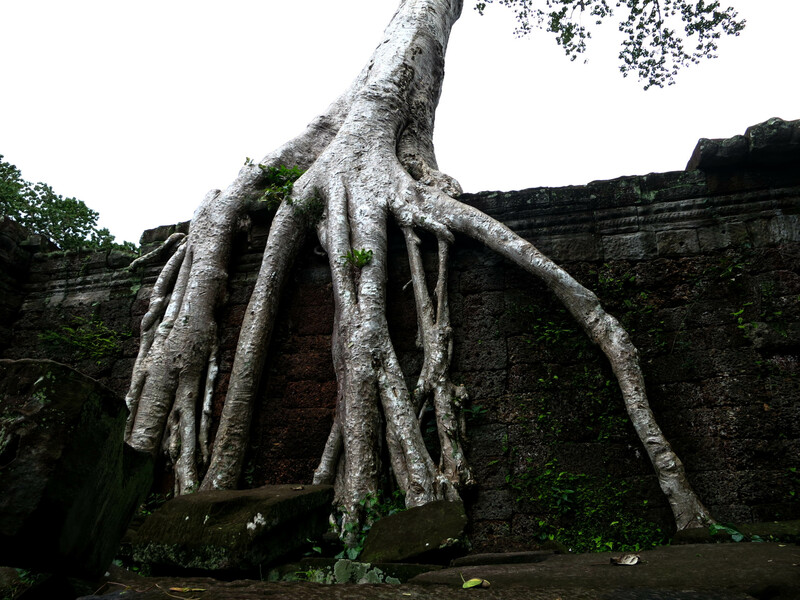 Aside from Angkor Wat, by far my favorite sight was Preah Khan. 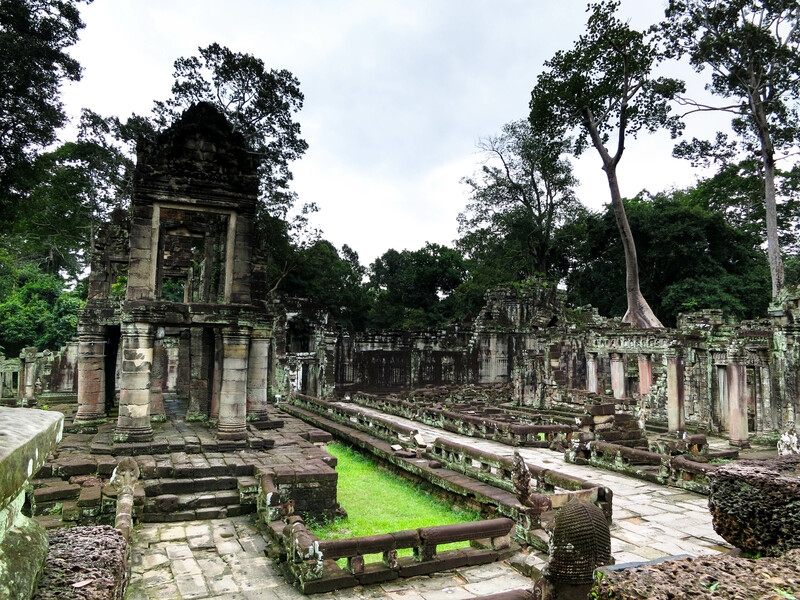 The complex was huge and it was once the location of a university for monks. There were four long halls entering the complex which started in the North, South, East, and West. 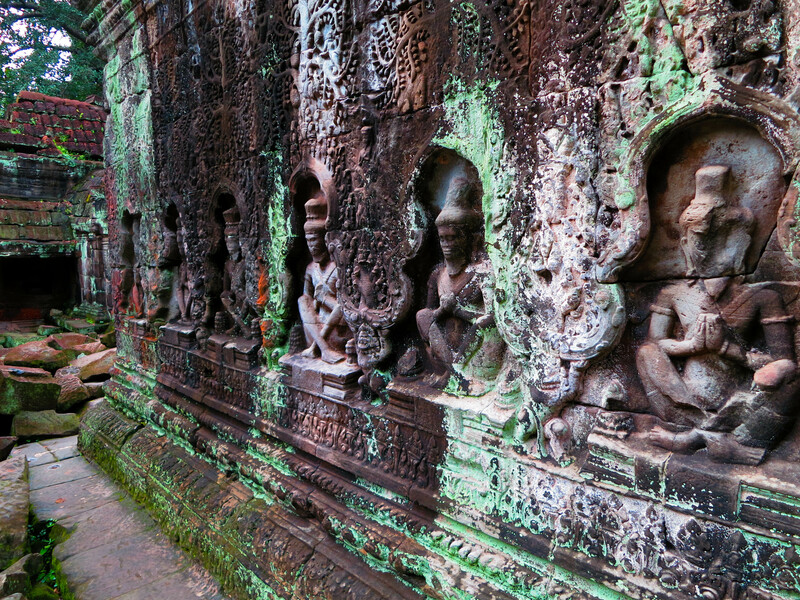 Each hall represented Vishnu, Shiva, Brahma, and Buddha. 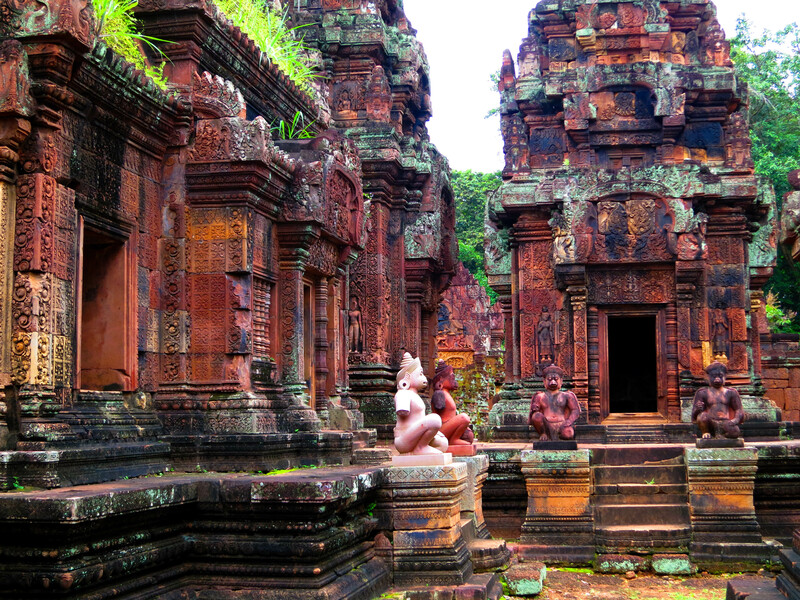 It was thus considered a fusion temple since it offered respect to both Hindu and Buddhist doctrines. I enjoyed the temple so much that I visited it twice, mostly because it was raining the first day. But, that too captured it in a unique beauty. 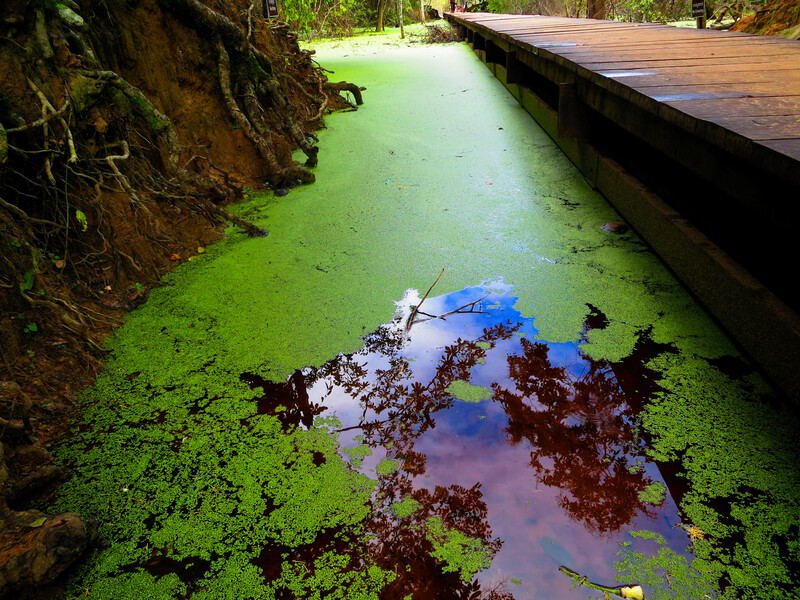 Rain or shine, the algae was always vibrant. 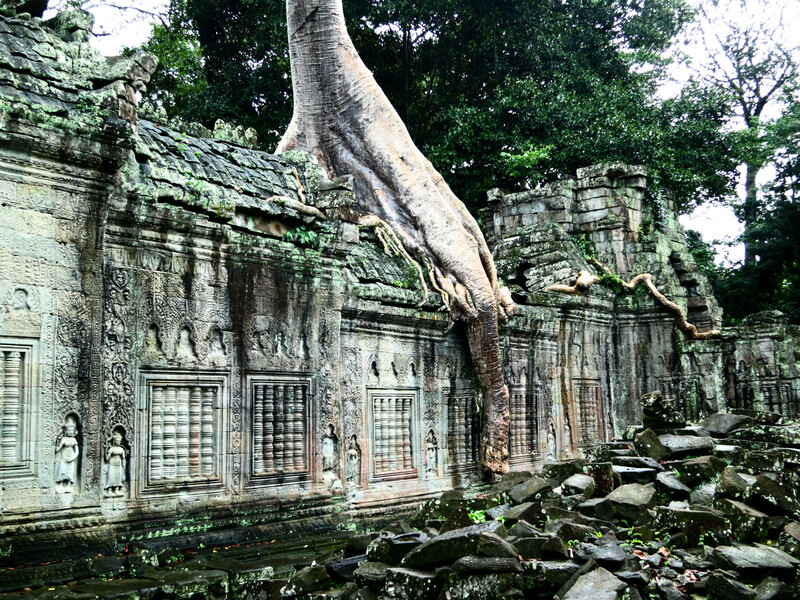 The site was also famous for its trees growing over the temple walls. 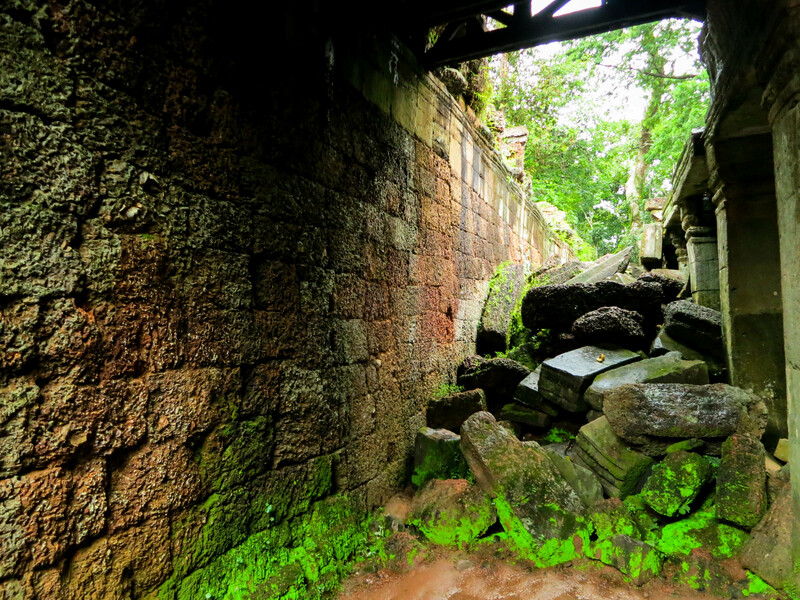 The complimentary contrast of the weathered red walls and the moss was extraordinary. Take two HDR style, on a brighter day. Another fortuitous HDR as the clouds quickly rolled in. 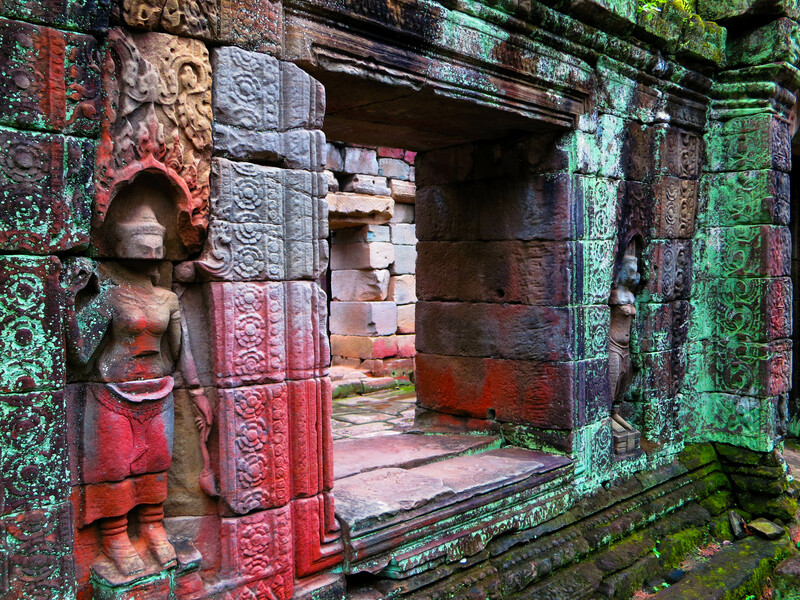 This entry was posted in Asia and tagged angkor, baphuon, bayon, buddhist, Cambodia, featured, hindu, Khmer, lingas, preah khan, roots, ruins, siem reap, temples, tomb raider, trees. Bookmark the permalink.